Labor Curious? 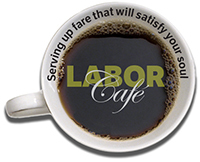 Visit the Labor Café for Caffeine, Conversation, and Community! The Labor Café is where the ND community convenes for coffee and casual conversation on contemporary questions about work, workers, and workplaces. Participants choose the topics, all people are welcome, and all opinions are tolerated.